Air bags save thousands of lives each year, according to The National Highway Traffic Safety Administration (NHTSA). In frontal crashes, air bags reduce deaths among drivers by about 30% and among passengers by 27%. 1. Obtain an information brochure and request form from NHTSA, dealerships or repair shops. 2. Return the form to NHTSA. 3. Receive authorization from NHTSA after it reviews the case. • having a medical condition that puts them at risk of injury when an air bag deploys. If you have children it’s important to make sure they are secured properly when you drive with them. They are almost always safer when riding in the back, in a car seat that is appropriate to their age and weight. 1. Never put an infant in the front seat of a vehicle with a passenger air bag. 2. Route harness straps in lower slots at or below shoulder level. 3. Keep harness straps snug and fasten the clip at armpit level. 4. Make sure the straps lie flat and are not twisted. 5. Dress your baby in clothes that allow the straps to go between the legs. Adjust the straps to allow for the thickness of your childís clothes. Do not use bulky clothes that could increase slack in a crash. 6. To keep your newborn from slouching, pad the sides of the seat and between the crotch with rolled up up diapers or receiving blankets. If your childís head flops forward, the seat may not have reclined enough. Tilt the seat back until it is level by wedging firm padding such as a rolled towel, under the front of the base of the seat. 7. Put the car seat carrying handle down when in the car. 8. Infants must ride in the back seat facing the rear of the car. This offers the best protection for your infantís neck. 9. Recline the rear-facing seat at a 45-degree angle. A firmly rolled up towel under the car seat may help. 10. All new car seats are now required to come equipped with top tether straps. A tether strap is a belt that is attached to the car seat and bolted to the window ledge or the floor of the car. They give extra protection and keep the car seat from being thrown forward in a crash. Tether kits are also available for most older car seats. Check with the manufacturer to find out how to get a top tether for your seat. Install it according to instructions. The tether strap may help make some seats that are difficult to install fit more tightly. 1. Is too old. Look on the label for the date it was made. If made before January 1981, the seat may not meet strict safety standards and its parts are too old to be safe. Some manufacturers recommend using seats for only 6 years. 2. Was ever in a crash. If so, it may have been weakened and should not be used, even if it looks all right. 3. Does not have a label with the date of manufacture and model number. Without these, you cannot check on recalls. 4. Does not come with instructions. You need them to know how to use the car seat. Do not rely on the former ownerís instructions. Get a copy of the manual from the manufacturer. 5. Has any cracks in the frame of the seat. 6. Is missing parts. Used seats often come without important parts. Check with the manufacturer to make sure you can get the right parts. To find out if your child safety seat has been recalled, you can call the Auto Safety Hotline at 888-DASH-2-DOT. If the seat has been recalled, be sure to follow the instructions to the recall or to get the necessary parts. You should also get a registration card for future recall notices from the Hotline. To find out more information about infant or toddler car seats, go to the Web site of the Insurance Institute for Highway Safety at www.highwaysafety.org. Also check out the National SafeKids Campaign at www.safekids.org which offers a free Child Car Seat Locator which allows you to enter your childís age and weight, and get back a list of recommended car seats. Another good source of information on car seats is the American Academy of Pediatrics website at http://www.aap.org/family/ which offers a detailed shopping guide to car seats. Is your child ready for a regular seat belt? Keep your child in a car seat for as long as possible. When he or she is big enough, make sure that seat belts in your car fit your child correctly. The shoulder belt should lie across the shoulder, not the neck or throat. The lap belt must be low and flat across the hips, not the stomach. The childís knees should bend easily over the edge of the vehicle seat. Seat belts are made for adults. If the seat belt does not fit your child correctly, he or she should stay in a booster seat until the belt fits. 1. Never tuck the shoulder belt under the childís arm or behind their back. 2. If only a lap belt is available, make sure it is worn tight and low on the hips, not across the stomach. Use lap belts only as a last resort. Try to get a lap-shoulder belt installed in your car if it doesnít already have one. These features reduce the risk of death or serious injury when a crash occurs. You can get a rating of crashworthiness from the Insurance Institute for Highway Safetyís website at http://www.highwaysafety.org. Belts, airbags and head restraints all work together with a vehicleís structure to protect people in serious crashes. Lap/shoulder belts hold you in place, reducing the chance youíll slam into something hard or get ejected from the crashing vehicle. If you arenít belted, youíll continue moving forward until something suddenly stops youóoften a hard interior surface that will injure you. Airbags and lap/shoulder belts together are very effective. However in some circumstances, inflating airbags cause serious injuries and even death. The greatest risk of injury from an inflating airbag is if youíre on top of, or very close to an airbag when it starts to inflate. Choose a car that allows you to reach the gas and brake pedals comfortably without sitting too close to the steering wheel. Some cars offer telescoping steering column adjustments that may help. Head restraints are required in front seats of all new passenger cars to keep your head from being snapped back, injuring your neck in a rear-end crash. But there are big differences among head restraints. Some are adjustable, and others are fixed. They also vary in height and how far theyíre set back from the head. To prevent neck injury, a head restraint has to be directly behind and close to the back of your head. Look for cars that have this type of restraint. If the restraints are adjustable, maker sure they can be locked into place. Some donít lock, which means they can be pushed down in a crash. When you brake hard with conventional brakes, the wheels may lock and cause skidding and a lack of control. Anti-lock brakes pump brakes automatically many times a second to prevent lockup and allow you to keep control of the car. If you were trained to brake gently on slippery roads or pump your brakes to avoid a skid, you may have to unlearn these habits and use hard, continuous pressure to activate your antilock brakes. Anti-lock brakes may help you keep steering control, but they wonít necessarily help you stop more quickly. Other design characteristics can influence injury risk on the road. Some small utility vehicles and pickups are prone to rolling over. “High performance” cars typically have higher-than-average death rates because the drivers are tempted to use excessive speed. Combining a young driver and a high-performance car can be particularly dangerous. The first years teenagers spend as drivers are very risky. In fact, teen drivers have the highest death rates of any age group. In 1997 alone, more than 5,700 teenagers died in motor vehicle crashes, and many more were left severely and permanently injured by crashes. While getting a driver’s license is an exciting rite-of- passage for teens, it can be enough to make a parent frantic. The Insurance Institute for Highway Safety (IIHS) and the Insurance Information Institute (I.I.I.) say there’s something worried parents can do to protect their teens — choose a safe vehicle. Teen drivers not only lack experience, but may also lack maturity. As a result, speeding and reckless driving is common. Sports cars and other vehicles with high performance features, such as turbocharging, are likely to encourage speeding. Choosing a vehicle with a more sedate image reduces the chances your teen will be in a speed-related crash. Sport utility vehicles, especially the smaller ones, are inherently less stable than cars because of their higher centers of gravity. Abrupt steering maneuvers – the kind that can occur when teens are fooling around or over-correcting a driver error – can cause rollovers in these less stable vehicles. A more stable car would, at worst, skid or spin out. Small vehicles offer much less protection in crashes than larger ones. However, this doesn’t mean you should put your child in the largest vehicle you can find. Many mid- and full-size cars offer more than adequate crash protection. Check out the safety ratings for mid-size and larger cars. Most of today’s cars are better designed for crash protection than cars of six to ten years ago. For example, a newer, mid-size car with airbags would be a better choice than an older, larger car without airbags. Before you make a final choice on the car your teenager will drive, consult the U.S. Department of Transportation ( http://www.dot.gov ) or the Insurance Institute for Highway Safety ( http://www.iihs.org ). People 55 years or older are less likely to drive aggressively or too fast. Thatís the reason that most insurance companies offer discounts to drivers over 55. Still, older drivers are likelier to have impaired hearing and slower reflexes, or to be using prescription drugs that might impair their reaction time. Older driversí eyesight deteriorates, so they need more light to see, are more sensitive to glare and have a narrower peripheral field of vision. So if you are having problems driving at night or in difficult conditions, use common sense and try to avoid driving when it is dangerous. If you drive when you are not physically able to do so safely, your insurance company may not renew your coverage. You may also want to take a defensive driving class designed for seniors. Inform your insurer that you have taken the class and you may be eligible for a discount on your insurance premium. If you are already in an area that is being hit by bad weather, donít try to drive your way out of it. Seek shelter for both you and your car and wait for the storm to pass. According to the National Safety Council, in 2000, there were 490,000 animal-related accidents resulting in 100 deaths and 10,000 injuries. 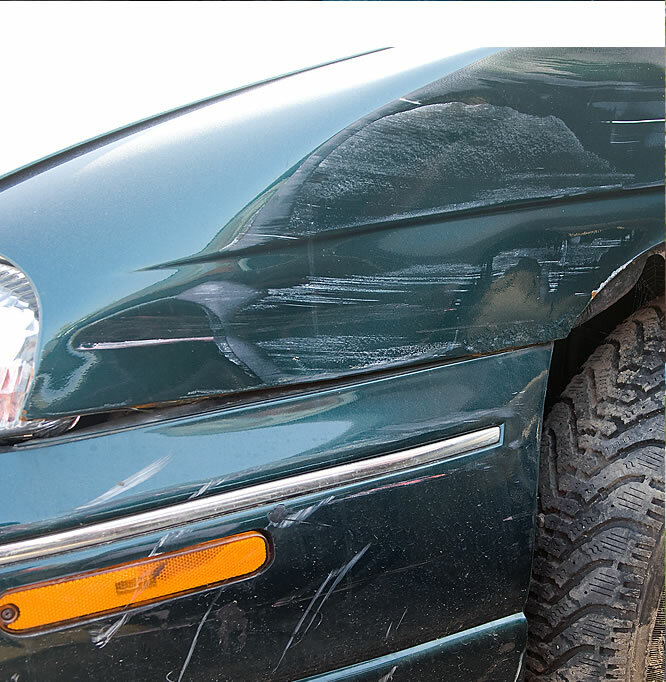 Deer/auto collision cost about $2,000 per claim for repairs and injuries. However, costs could run as high as $8,000. If you must talk while you drive, the safest way is to have a hands-free cell phone cradle installed in your car so you can speak while driving with two hands. Even so, remember to stay aware of what is going on around you on the road. Itís easy to get so engrossed in conversation that you miss exits or donít notice what other drivers are doing. Better yet, wait until you have arrived at your destination or pull over to the side of the road to begin your cell phone conversations. 1. Think of saving your life first. Only then, think of your car and what’s in it. 2. If another car bumps your car, stay inside with the windows shut and the door locked and drive to the nearest police or fire station. 3. Donít stop at isolated pay phones, cash machines or newspaper machines where you could become a carjacking victim. 5. Always keep the windows of your car shut and doors locked, whether youíre in or out of your car. 1. Keep your registration card in your wallet instead of your glove compartment. 2. Use paint or an indelible marker to put the vehicle identification number (VIN) under the engine hood and trunk lid and on the battery. This number is usually found on the dashboard on the driverís side of the car. 3. If you have to leave personal property in your car, leave it in the trunk. 4. Keep your car in a garage and lock the garage door. 5. Use a security device like a steering wheel lock or a gear shift column lock. If your car is stolen, have the following information to give to the police: 1. Year, make, model and color of the car. 4. Names of any witnesses. 1. Never get out of the vehicle to make a repair or examine the damage on a busy highway. Get the vehicle to a safe place before getting out. If you’ve been involved in an accident, motion the other driver to pull up to a safe spot ahead. 2. If you canít drive the vehicle, it may be safer to stay in the vehicle and wait for help or use a cell phone to summon help. Standing outside the vehicle in the flow of traffic, under most circumstances, is a bad idea. 3. Carry flares or triangles to use to mark your location once you get to the side of the road. Marking your vehicleís location to give other drivers advance warning of your location can be critical. Remember to put on your hazard lights! 4. In the case of a blowout or a flat tire, move the vehicle to a safer place before attempting a repairóeven if it means destroying the wheel getting there. The cost of a tire, rim or wheel is minor compared to endangering your safety.